This grain free turkey dinner for cats is made using 100% nutritious ingredients that will keep your pet full of health and happiness. 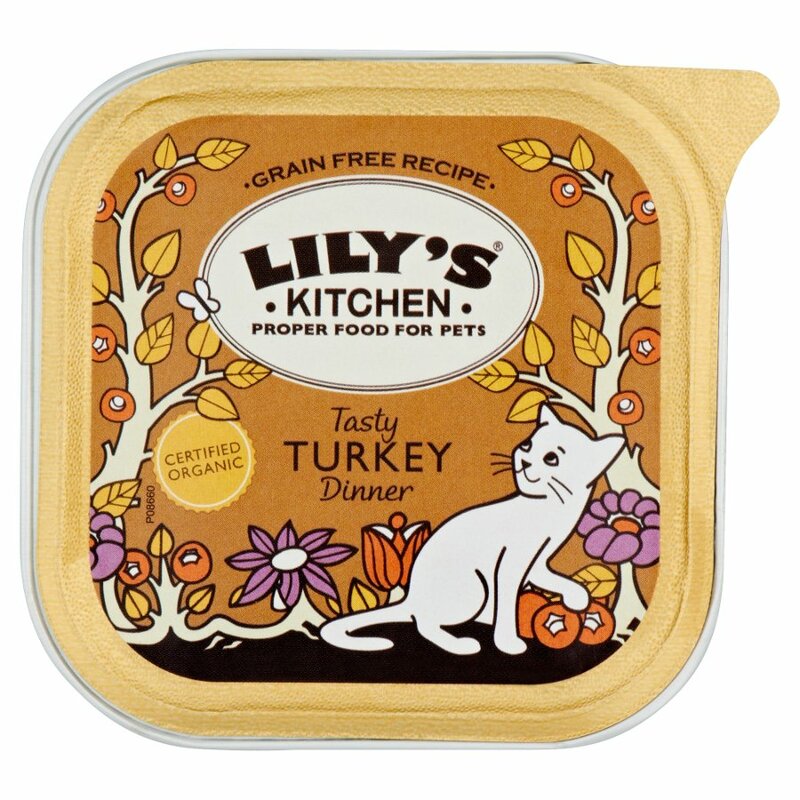 Lily’s Kitchen design their recipe with a high organic meat content and essential herbs to keep them shiny including taurine, which cats need in their diet. Only real meat is used in this recipe; no rendered animal parts, carcass or derivatives, nothing genetically modified, no artificial preservatives, colours, taste enhancers or sweeteners are included. 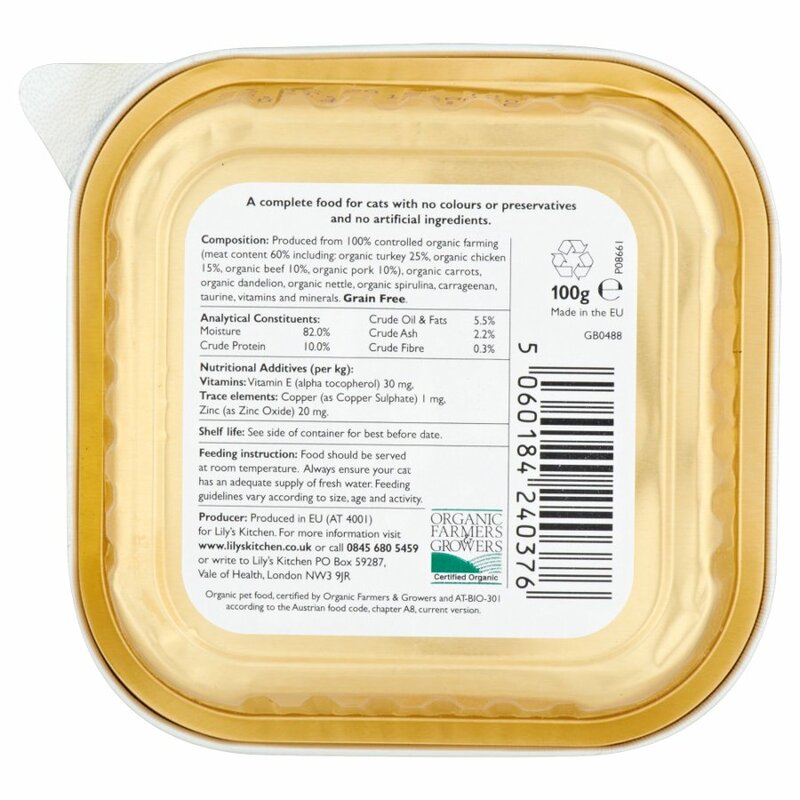 It also contains no wheat, corn or soya and Lily’s Kitchen use only nourishing meats and herbs to create a delectable and digestible food for your cat. They use water based or vegetable based inks for printing on the packaging to help minimise waste and toxicity. Lily's Kitchen are recognised by the Good Shopping Guide as the UK's Most Ethical Pet Food Company. Made in the EU. I find I need to chop this up, and it is too pricey for six voracious eaters all the time but otherwise a great option and there's the tray for them to lick out afterwards. I also like being able to put the trays in the recyling, unlike pouches. Our 3 boys go crazy for Lily's as soon as you open the cupboard door to feed them they come running. Since we switched to Lily's we've found that their fur is in far better condition, with reduced knotting of Lilo's long fur. rnrnWe have also found that with Lily's having less water in it the boys don't need as much, generally between the three of them they have 4 packs a day and some dry. With the pouch food they had before they would have 6 packs a day and some dry.